Kevin Henkes clearly gets kids. His picture books nail various aspects of kid-dom straight on the head. Lilly’s Purple Plastic Purse is a perfect portrait of the first time you get in trouble. When parents came into the bookstore asking for my-kid-is-getting-a-sibling books (and in Cobble Hill, Brooklyn, they came in looking for that a lot) I always recommended Julius, the Baby of the World first. Which was why I was so surprised that much of Junonia didn’t seem to understand kids at all. 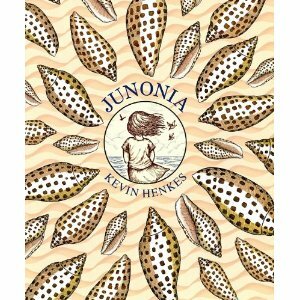 Junonia is the story of Alice, a trip to Florida, and her tenth birthday. It is a big one. It’s the last time you will be able to count your age on your fingers. It’s the first time you’re in double digits. But the birthday/vacation starts to quickly fall apart as more and more things that Alice loves about their yearly Florida trips are changed or taken away. At its core I love this kind of story: a simple coming-of-age story where kids deal with very everyday problems. They usually make for the sweet, quiet, touching story that adults who love kids’ books gravitate towards. And therein lies this problem: I think this is a book for adults who like kids books. The summer before I started high school I had a lengthy summer reading project to do for school. One of the books I had to read was Ray Bradbury’s Dandelion Wine. I hated it. It became clear when it was time to discuss the novel in class that I was not the only one. The book is a nostalgic portrayal of childhood summers. Our teachers could not believe we did not see the beauty in its descriptions and sentiment. We were children who had to read this book over the summer instead of doing the things described in the book. We were not nostalgic for childhood summers yet. The whole point of the book was lost on us. There are worse things in the world than being compared to Ray Bradbury. But the first half of this book was that experience all over again. Kids are not nostalgic for their summers in Florida searching for seashells. But then it starts to turn it around. Alice is deeply stung by a comment one of the older characters makes. When talking about Mallory, the younger, vaguely-obnoxious new vacation neighbor, he says “That little blond one sure is a screamer, but she is the prettiest girl I ever saw.” All of us realize we are not the prettiest or smartest or funniest or nicest girl ever. Such a thing does not really exist. But it still hurts in a very special way when someone else is singled out for being especially pretty, smart, funny, or nice over you. And Alice’s lingering reaction to this comment was genuine and touching. There are a couple more moments that stood out for me in the same way. Following the “prettiest girl” incident, Alice’s father asks if she would like a little “bed supper.” This is the greatest idea in the history of sullen child parenting. It’s the most comforting thing I can imagine and I want someone to make me bed supper. There was also the walk through the cemetery, which some authors might have painted as creepy or depressing, but here Kevin Henkes just says she was bored. Which is exactly what most kids feel when they’re made to walk through a cemetery. It’s so boring. The letter from the publisher at the beginning of this galley positions this book squarely in the early chapter book market, hoping to bridge the gap between the Wemberly Worried and Olive’s Ocean sets. Other than the fact that this book is so startlingly short, though, it has no business being there. The language is flowery with difficult vocabulary. The sentiments, I mentioned already, are distinctly un-7-year-old. In the beginning I thought this would be a two-star book, but some of the later genuine kid moments bumped it up to three. It’s released tomorrow, May 24th. Give it to an especially precocious 7-year-old or your grandmother who used to be a children’s librarian who is now retired and lives in Florida. They’ll both love it.